This evening another magical and exhausting concert weekend begins here in Champaign-Urbana as our esteemed guest, Dr. Craig Jessop, comes to lead the Chorale in the music of John Rutter. We rehearse Friday evening, all morning and afternoon on Saturday, including with the orchestra, then on Sunday afternoon, and finally the concert arrives on Sunday at 7pm. If you are in the area come see us at Faith United Methodist Church, 1719 S. Prospect Rd. The concert is free, and the conductor, formerly of the Mormon Tabernacle Choir, manages to pull some pretty extraordinary sounds from a choir made up of non-auditioned regular folks who like to sing and are willing to commit to long hours of rehearsal (did I say regular? Maybe I should rethink that). The pieces are mainly for chorus and orchestra, except for the two whose accompaniments feature the group's handsome organist. 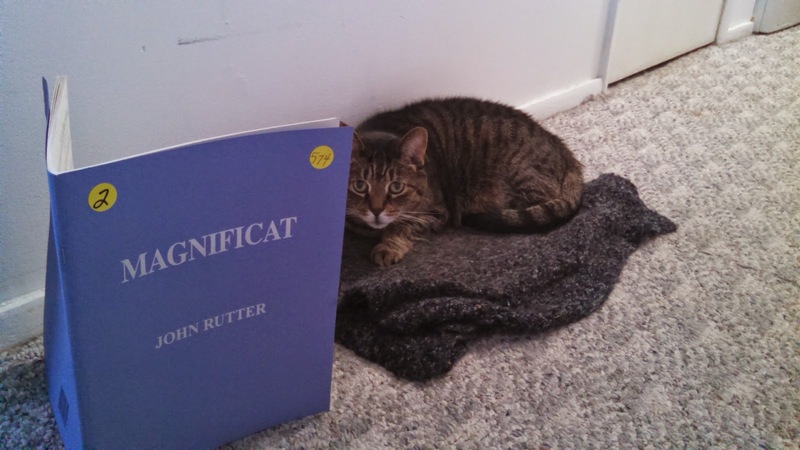 The main work on the program is Rutter's "Magnificat," which, I can tell you, is 85-pages long and in 7 movements. I'm not sure how long it runs in performance, but I doubt you'll be looking at your watch. It is filled with moments of great beauty and power, some intriguing text setting, and infectious dance rhythms. I was quite honored and touched that the group dedicated this piece to me, particularly as I have grown quite fond of it. The work begins with a festive tune that you'll hear again later; a pageant of ideas pours forth in this dance movement which is fully a quarter of the work's length. I confess that it did not make a very good impression on me the first day I sat at the piano and read through it; then its Spanish elements and celebratory nature won me over. It is followed by the most sonorously stunning part of the work, a medieval-sounding piece set to a 15-century English poem, that is hauntingly beautiful in its simplicity. The several stanzas of the poem each explain the symbolism behind the five branches of the rose (that doesn't need to be botanically accurate, does it?). Besides the sheer beauty of the melodic ideas (cast in dorian and mixolydian modes, which were big in the Middle Ages and vanished in the 17th century to return only in the 20th) is the interesting text setting that Rutter employs here. Sometimes he seems intent on accenting just the wrong syllable to give the piece an ancient feel--either because the syllabification shouldn't feel too familiar or too easy the gloss over, or to highlight the rhyme scheme. It is odd, perhaps, that Mary should just have begun her magnificent hymn of praise and then have it interrupted by a hymn TO her, but it does illustrate her last point in the movement above, that "all generations shall call me blessed." Here some of them are, doing just that. And it is a mark of modern composers that often liturgical works borrow from other sources as well. The third movement begins with part of the Ordinary of the Mass, which is, of course, not part of the Magificat text from the gospel of Luke either. But it fits well here, because Mary is extolling God, and says "holy is his name." The choir fills out the thought with the Sanctus that surrounds it, also a hymn of praise to God, beginning with the thrice-repeated "holy" and continuing the praise over "all the earth." And here are the trumpets and drums, or in this case, since we are using the chamber version with organ and only one horn, is the organ's first big moment. Actually, I don't get to play the first or second movements at all, as the organ remains silent. It is always interesting as I make the sudden switch on Festival Concert weekends from rehearsal accompanist to member of the orchestra how many of my favorite notes get taken away! But it will also be a pleasure letting someone else do the heavy lifting by Sunday evening. And the tonal variety will surely be a breath of fresh air for the Chorale after having merely an out-of-tune piano doing the honors the entire semester! The fourth movement is also quite beautiful, and tricky, as the Chorale found out, for it is a simple repetition of the same one-measure figure, but in various modes and keys, through all kinds of progressions, from darkness to light, tension and release, and the shifting harmonies require the ear to hear them beforehand. There is a lovely soprano solo atop the choir. But it is probably the fifth movement that is the most interesting. It begins with the phrase" God's mighty power." Now how would you set that to music? Trumpets, drums, loud, powerful chords? Not Mr. Rutter. The opening of this movement sounds more like a spy thriller. It is jazzy and syncopated, but it starts very quietly. The first entrances for the basses and tenors are at pianissimo. I once suggested to the basses that it should sound like they were trying to steal a diamond without being detected. To get the point across, at another rehearsal I played the theme from Mission Impossible. Suppose you had a message that you didn't think was going to be very popular--even dangerous. If you're not familiar with Mary's Magnificat--the entire text, not just the "nice" part at the beginning, you may be completely surprised to learn that there are some very subversive political overtones. Now in this country, if you use terms like "social justice" or talk about raising the minimum wage, you can be accused of "class warfare." But that's not even a fraction of what Mary is saying. Not only does she think that God "exalts the humble (poor)" but that He is going to bring down the powerful. Those folks that make billions of dollars by exploiting their workers and polluting the environment--they're gonna pay for that. Those political leaders who are only concerned with hanging on to their own power and influence and don't look out for the ones who don't have it so easy--your time is coming. That's not the sort of message you can deliver in broad daylight, especially if you are in a particularly oppressive situation. It reminds me of how black slaves sent their messages in coded songs so their masters wouldn't understand--masters who were already on the lookout for signs of rebellion and did everything they could to keep slaves from being able to conspire with one another because they knew it could bring trouble for them. If you are in power, the last thing you want to hear from a disposed underclass is how unhappy they are and how God--or anybody--is going to do something about it. And if you are in power, of course, you are also in the best position to retaliate harshly against such talk. So if you are being oppressed you've got to spread your message quietly. psst...God's going to make sure justice gets done here...pass it on. "He hath filled the hungry with good things..."
It is a two-part thought, and Mr. Rutter is sensitive to this, which is why one piece glides seamlessly into the other, as the harshness of the one becomes a beautiful and uncomplicated vision of the other. Mary can't quite finish one thought before beginning the other, so the actual text bobs back and forth (many texts from the Bible are stubborn like this!) but the composer wants to give both visions a piece of their own, and in due season. Finally, a montage of texts to conclude the work. The seventh movement begins with the organ fanfare from the third movement. The text is from the "Gloria Patri," which we'll hear the rest of after we take a short break for this prayer to the Virgin. Mary has stopped speaking; she has concluded at the end of the sixth movement when she remembers God has promised all of this to "Abraham and his seed forever." There isn't much for her to say after that. But a musical work must have a more satisfying conclusion. A climax is not an end. So after Mary's approstrophe old themes are brought back to round out the work. At the words "as it was in the beginning" what do we hear but the music that was at the beginning--of the entire Magnificat. It is a nice touch--if you can remember back half-an-hour and know your Latin. And, with a few tongue-tripping exceptions, the whole opening section returns for a bow and a triumphant series of amens. It is quite a journey. I hope you are able to take it with us this Sunday evening at 7. Erasmus, seen here studying the score, was under the mistaken impression that the piece was about a "magnificent cat."